Learn to stand up paddleboard this summer in your own waterfront backyard. 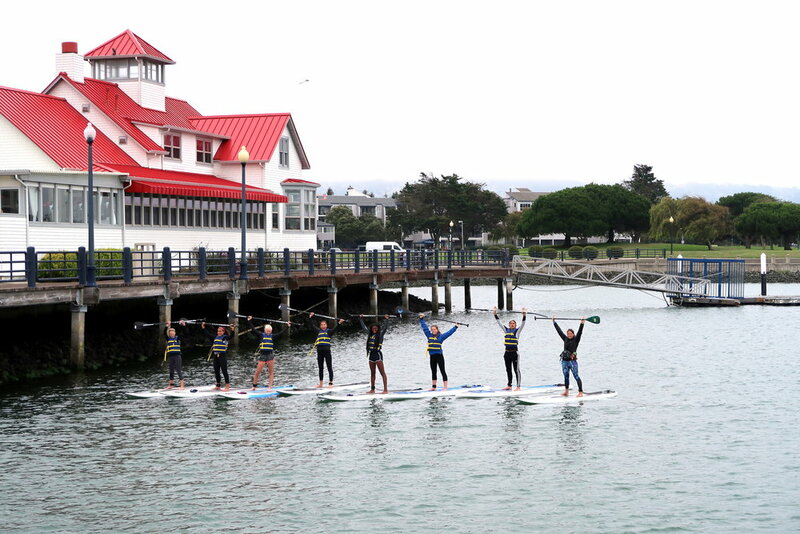 510-Waterline will hold weeklong teen SUP program at Benicia Marina Yacht Club in Benicia and Marina Bay Yacht Harbor in Richmond. Learn to paddle, be safe on the water, and have fun! During our week on the water our hope is to foster and build a life long love of the water and being outdoors. Monday starts with dry-land introduction to paddling; including the SUP basics, paddle techniques, water safety, and SUP gear and equipment handling and care. We will then take this new knowledge and skills and get out on the water! As we progress, developing paddling skill, balance, coordination and paddling endurance through out the week we will take paddle adventures out of the protected marina exploring more of the Benicia and Richmond waterfronts and waterways of the Benicia and Richmond Harbors. One day will include a SUP yoga session, other days we will practice efficient SUP strokes and turns, building strength, coordination and balance on the board. On the last day we will get wet (if we haven't already), practicing SUP rescues and challenging water games. Activities will be water, weather, and individual ability dependant to ensure everyone's safety. Carabineers to attach flip-flops, water bottle, stuff to your board. Wear a swimsuit underneath exercise pants, board shorts or yoga pants (shorts and capris are good since you tend to get wet up to your mid-calf when standing on the board). A long sleeve top, sun shirt, or rash guard are good on top. Layers are always good for changing weather. Do not wear cotton. If you have your own PFD feel free to bring it. A hat - baseball or sun hat. Flip-flops or some type of water shoe. A complete and warm change of clothes. Please bring snacks for the morning sessions. Lunch is not provided. Medical & Release of Liability Forms: Both our 510-Waterline Liability Release and 510-Waterline Summer Program Medical Form must be completed and turned in a week before the first day of the SUP program. 510-Waterline will mail these forms once you have registered. Teens take easily to SUP and enjoy it a great deal. Each day will start with a short comprehensive on-land lesson including the basics of paddleboarding; covering water safety, proper stance, form and stroke technique. We'll then head out on our boards, practice these skills, and above all, have fun! Everyday is different with a new focus increasing skill level. During our five-day camps, one day will focus on SUP yoga. Teens will learn how to anchor their board on the water and go through some simple poses. We offer one to five day workshops and camps. All teens must know how to swim.